Once a highflying stock, GoPro has officially been grounded. GoPro's (GPRO)fall from grace has been stunning. The latest blow came this week as the wearable camera maker's shares crashed below their IPO price of $24. That means virtually all GoPro common stock investors -- even institutional ones who got in early -- are now staring at a loss. The pain is far greater for those who bought GoPro near its peak of $98, reached just months after its blockbuster debut. "The IPO price is a technical cliff. When stocks break below it, they tend to go down with even more of a thud," said Kathleen Smith, a principal at Renaissance Capital, which manages IPO-focused ETFs. GoPro has been in decline for months, but the crash has accelerated lately as Wall Street's appetite for risk has been curbed by slowing economic growth and a looming interest rate hike by the Federal Reserve. 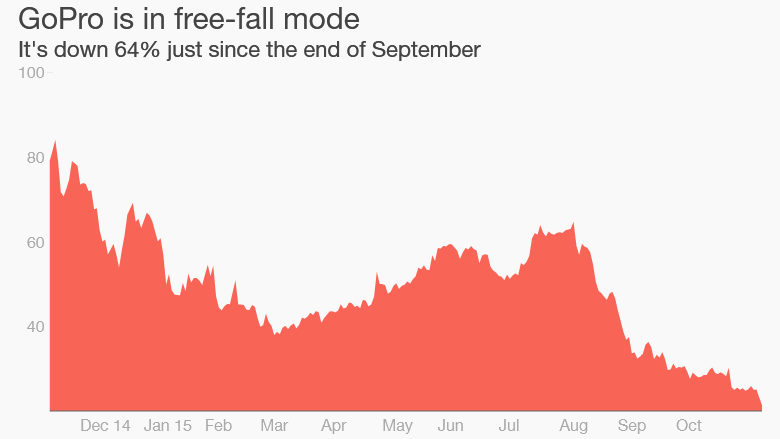 Just since the end of September GoPro shares have lost a remarkable 64% of their value. The problem is that GoPro's euphoric introduction to Wall Street set the bar very high on CEO Nick Woodman to continue the company's rapid growth. That hasn't happened. In fact, it's slowing down. Sales surged 72% in the second quarter but just 43% last quarter and GoPro is now warning sales will actually decline during the critical holiday season. "That's terrible. That's a significant deceleration," said Smith. 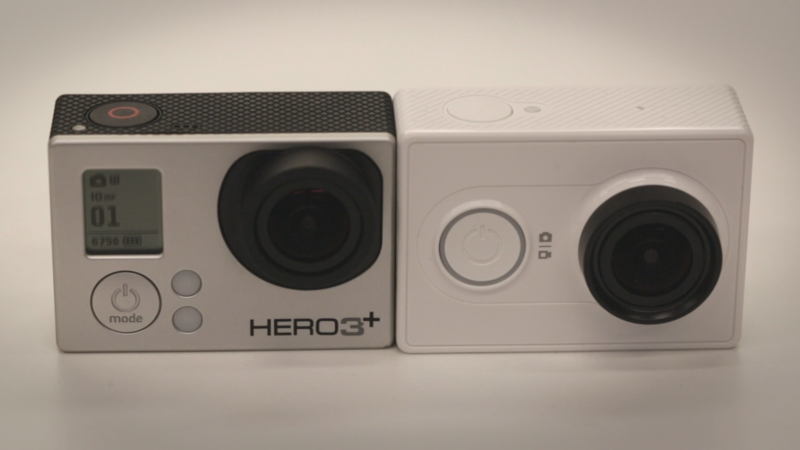 The GoPro brand remains a powerful one. The camera maker has an impressive 3.5 million followers on YouTube and users swear by the product. But that doesn't always translate to continued growth. Piper Jaffray analyst Erinn Murphy recently downgraded GoPro to a rare "underperform" rating amid concerns about a lack of new products this holiday season. While she does "believe in the brand," Murphy pointed to red flags indicating GoPro is suffering from competition -- including from new devices that are cannibalizing sales of older ones. GoPro's business with key accounts such as Best Buy have reversed from up 62% in the second quarter to down 26% in the third quarter. "This brand likely has fallen off Santa's wish list this season," Murphy said. Could Apple save the day? GoPro is hoping to turn things around by trying to make money off its incredible content of extreme sports activities. The company is also expanding into the drone market, though that's a risky endeavor. There's also the chance a cash-rich tech company will swoop in to buy GoPro on sale. "This company continues to grow profits and at the end of the day it will be bought by a Google or Apple," wrote StockTwits user WingsJr. Related: Will drones save GoPro? No matter what happens to GoPro, its incredible decline should serve as a lesson to investors who get overly excited about hot young brands. "People got so enthusiastic on GoPro. If there's a lot of euphoria in a name, you've got to be cautious about it," said Smith. That sense of caution is now invading other newly-minted public companies. Twitter (TWTR), Etsy (ETSY) and El Pollo Loco (LOCO) -- each of them red-hot stocks of their own at one point -- have all broken below their IPO price in recent months. Companies hoping to go public are taking notice. Fintech company LoanDepot yanked its IPO on Thursday due to difficult market conditions. Albertsons postponed its own IPO last month. And those going forward are more cautious. Square, the mobile payments company led by Twitter boss Jack Dorsey, signaled its IPO next week could value the company at less than what it was valued at a year ago in the private market. "If GoPro went public now, it would have a big discount," said Smith.